This article is about the geology use of the term. For other uses, see Stratum (disambiguation). "Strata" redirects here. For other uses, see Strata (disambiguation). 8,800 m (29,000 ft) thick in some areas. In geology and related fields, a stratum (plural: strata) is a layer of sedimentary rock or soil, or igneous rock that were formed at the Earth's surface, with internally consistent characteristics that distinguish it from other layers. The "stratum" is the fundamental unit in a stratigraphic column and forms the basis of the study of stratigraphy. Each layer is generally one of a number of parallel layers that lie one upon another, laid down by natural processes. They may extend over hundreds of thousands of square kilometers of the Earth's surface. 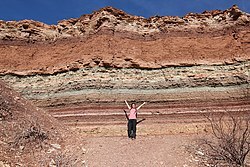 Strata are typically seen as bands of different colored or differently structured material exposed in cliffs, road cuts, quarries, and river banks. Individual bands may vary in thickness from a few millimeters to a kilometer or more. A band may represent a specific mode of deposition: river silt, beach sand, coal swamp, sand dune, lava bed, etc. Geologists study rock strata and categorize them by the material of beds. Each distinct layer is typically assigned to the name of sheet, usually based on a town, river, mountain, or region where the formation is exposed and available for study. For example, the Burgess Shale is a thick exposure of dark, occasionally fossiliferous, shale exposed high in the Canadian Rockies near Burgess Pass. Slight distinctions in material in a formation may be described as "members" (or sometimes "beds"). Formations are collected into "groups" while groups may be collected into "supergroups". Outcrop of Upper Ordovician limestone and minor shale, central Tennessee. Chalk Layers in Cyprus - showing classic layered structure. Heavy minerals (dark) as thin strata in a quartz beach sand (Chennai, India). Stratified Island near La Paz, Baja California Sur, Mexico. ^ "stratification | geology". Encyclopedia Britannica. Retrieved 2017-10-23. Look up stratum in Wiktionary, the free dictionary.